Daughter, I Love you. 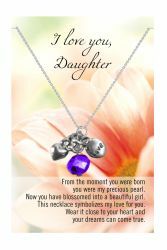 Lead Safe Pewter Charms Comes with the following poem: "From the moment you were born you were my precious pearl. Now you have blossomed into a beautiful girl. This necklace symbolizes my love for you. Wear it close to your heart and your dreams can come true."